BANGLADESH NATIONAL CADET CORPS (BNCC) published New job vacancy Notice at www.bncc.gov.bd. BNCC Job Circular offer total 49 New vacancy in this post. SIX, Eight, SSC, HSC And Graduate Student also apply this BNCC govt circular 2017. 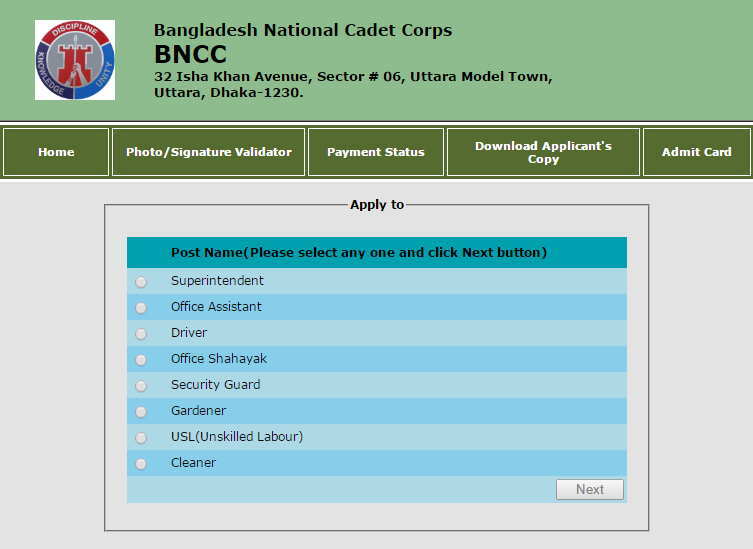 Bangladesh National Cadet Corps (BNCC) published New job Vacancy Notice,BNCC Admit card, BNCC application found at www.bncc.teletalk.com.bd official website. BNCC eRecruitment online admit card download will be started soon and You can Download Bangladesh National Cadet Corps job admit Card from there website or visiting ejobscircular.com . Online Application and Fee submission Start on 21 May 2017 at 09:00 AM and Teletalk BNCC online application will be end on 19 June 2017 at 05:00 PM. Many People Search www.bncc.teletalk.com.bd application form , admit card download in google. Now BNCC official website address available here. Before apply bncc job application through online keep reading this information. You can Get your exam center information by Teletalk mobile SMS . Here You can Download BNCC Seat Plan Full as a PDF file. If you forget your User or Password Call there help line 121 from Teletalk Mobile. Or Send email to [email protected] . For more updates about this BNCC Application Keep visit this website. Thanks for Stay with us.